Are you looking for the best fish tank kits to start your own fish tank aquarium or to give as a gift? Purchasing a fish tank involves a lot more than just buying a tank and putting water and fish into it. There are a number of fish tank supplies that are needed to keep your fish happy and healthy. The following fish tank kits provide a relatively inexpensive and easy way to buy a functional fish tank and ensure that it is ready to safely hold fish. The kits come with the basic accessories that one needs to operate a functioning fish aquarium. Of course. you may want to add accessories as time goes on, but these tanks are good for starting out and figuring out if owning and taking care of fish is the right choice. The Marina Style Deluxe Glass Aquarium Kit is a 5 gallon glass aquarium kit that offers a great way to get started as fish owner. The tank is a traditional rectangular fish tank that is eight inches long by sixteen inches wide by ten inches tall. The aquarium is a complete kit with everything that is needed to set up and operate a fish tank with happy and healthy fish. It includes a clip-on filter with quick-change filter cartridges (which makes for easy filter cartridges change outs), an incandescent light canopy with a 15-watt clear bulb. The filter system includes a Nutrafin AquaPlus and Nutrafin Cycle cartridge based filter that ensures that water in the tank stays clear. To help maintain the tank, the kit comes with a fish net, a thermometer, and a care guide. It even comes with fish food; you just need to supply the water and the fish. 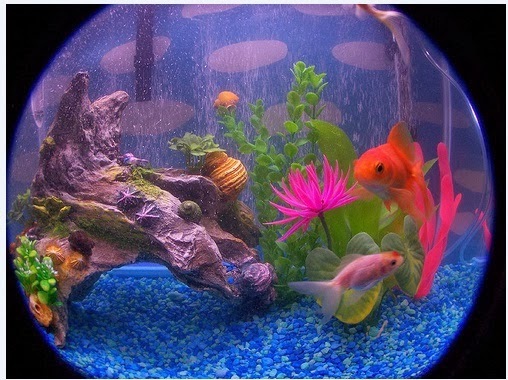 The aquarium kit also comes in a larger 10 gallon size for those who prefer a larger fish tank. The Tetra 29003 Crescent Aquarium Kit is a 5 gallon curved glass aquarium kit that is a great fish tank for small spaces. The aquarium kit features a low-voltage 16-LED light, a cartridge based filtration system, and a seamless aquarium with a clear plastic cover that helps to reduce water evaporation and that includes a feeding hole. 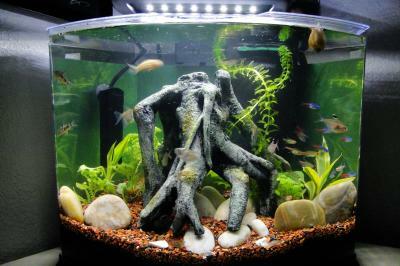 The aquarium kit also comes in a smaller 3 gallon size that is perfect for a desktop or extremely small spaces. 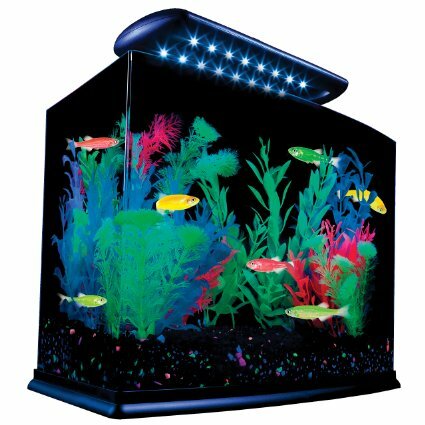 The GloFish 29045 Aquarium Kit with Blue LED light is a 5 Gallon curved-front aquarium that includes 15 blue LED lights that shine into the fish tank from above to bring out the colors of fluorescent glo fish and fluorescent materials placed in tanks. If you are looking for a cool colorful fish tank that fits well in a dimly lit area, the GloFish 29045 Aquarium Kit with blue LED light is what you are looking for. The aquarium kit includes a microfilter and a medium bio-bag for filtering the water. The tank is made of an acrylic material for added strength. It also comes in a 3 gallon crescent version that has a sharp curve for anyone who prefers that design. The JBJ Picotope Curved Glass Nano Aquarium Kit 3 Gallon is a small starter aquarium kit with many of the features that larger aquarium tanks offer, although with a more modest light and filer. It includes a 9 Watt clamp on light a slim power filter, an open tank top, and a small tank size for tight spaces. It is particularly well suited for tiny fish and cultivating beautiful corals in the tank. It may not be suitable for beta fish, since it has an open top and beta fish tend to jump out of the water. The Koller-Craft Aq15005 Aquarius Aquarium Kit is a sturdy 5 gallon fish tank made with seamless shatter-proof acrylic for durability and for panoramic viewing of the fish. It comes with a full hood with a feeding port and an internal filter. It includes LED lighting that can be set to several lighting options for different settings, including daylight white, moonlight blue, and a white/blue combo. Check the fish tank kit descriptions and product reviews carefully to ensure that the tank you are considering purchasing is what you are looking for and what you need for the type of fish you are planning on putting in the tank. Also, ensure that the fish tank kit comes with the accessories you need. These starter fish aquarium kits make great gifts for someone that is just getting started with owning fish, or for anyone looking to liven up a living space with some color and variety. The GloFish 29045 Aquarium Kit provides an excellent way to brighten up a living space, since its blue LED light produces vibrant fluorescent colors within the tank when fluorescent fish and accessories are placed in the tank. Having a nice fish aquarium setup with fish can freshen an interior space and even improve one's mood, as it adds life and vitality to an indoor area. Especially in northern climates, in which long cold winter nights cause people to spend a lot of time indoors. 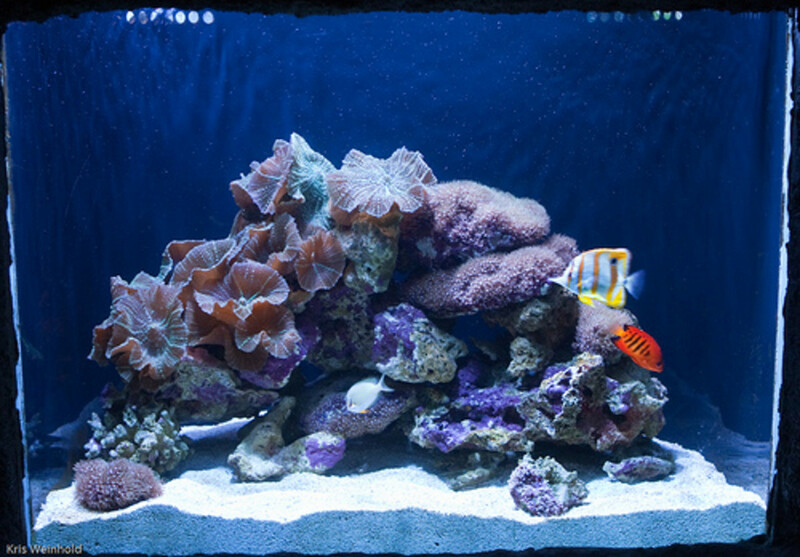 A well-lit fish aquarium can make a dwelling occupant feel connected to the living world, while outside the world is experiencing the "dead season" of winter. Fish tank kits are good for anyone looking to liven up a living space, particularly a living space that is dark or has no access to natural light, such as a room without windows. Not only will a fish aquarium bring light into a dark room, it will also bring some natural movement from fish swimming in the tank. Both the light and the interaction with living fish are good for the human mind, which is accustomed to living with light and other beings. If you have to spend a lot of time indoors, especially in the cold dark winter months, consider a fish tank filled with colorful fish and accessories to brighten up a room and your mood. It is soothing to have a fish tank in your home. Something about the light and the movement and colors are very relaxing. There is just something about having a fish tank in one's home that makes for a relaxing space. 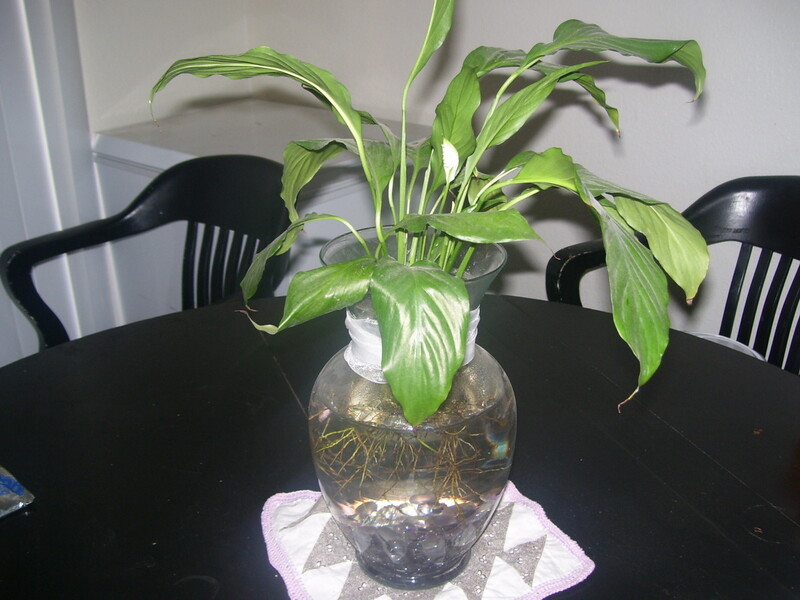 We used to have one and enjoyed the fish as they swam and made their home in the aquarium. Great comparisons on this topic. Beautiful fish tanks. I like the idea of having a fish tank and these choices are great. Thanks Eric and Ann. Amazing how much a nice fish tank can spruce up a living space. I love the bowed fish tanks - they seem to stand out better when lit. I don't have one, but I'd love to own one some day. All great suggestions. It sounds like you did your research. 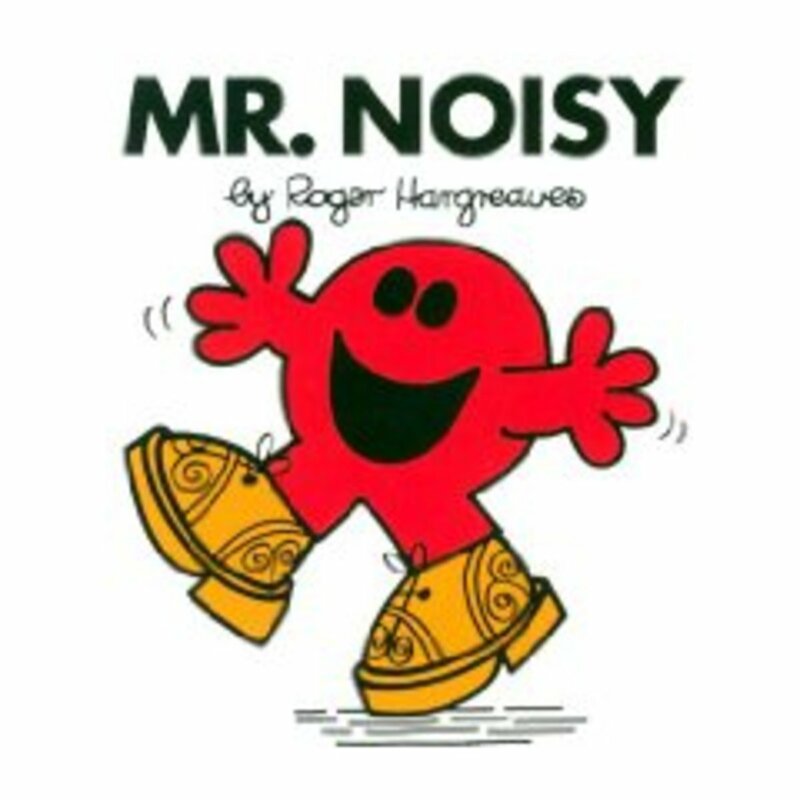 Great stuff here and a well done article. I just love my 8 Rosy Barbs and our simple 20 gallon aquarium -- really cool for my young son.